CPT President Mark Spivak, functioning as a research consultant in conjunction with Emory University’s Neuroscience Department, co-authored a third research paper published in a prestigious peer reviewed academic journal. 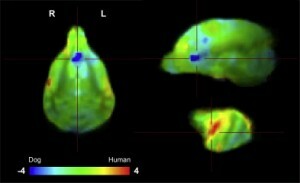 The article, entitled Scent of the Familiar: An fMRI Study of Canine Brain Responses to Familiar and Unfamiliar Human and Dog Odors, coauthored by Dr. Greg Berns, MD, PhD, Andrew Brooks, PhD candidate, and Mark Spivak, CPT, describes the olfactory cortex and caudate activation responses of 12 subject dogs exposed to a variety of social scents. 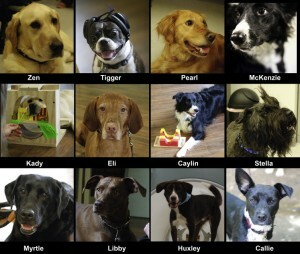 The 12 dogs that participated in the study. The scents consisted of familiar and unfamiliar human odors, familiar and unfamiliar third party dog odors, and the subject dog’s own scent. The researchers exposed the dogs to the scents while the dogs laid motionless in a Siemens 3T MRI. The researchers then measured the olfactory activation, to ensure that the dogs actually processed the odor, and the caudate activation, to measure the perceived reward or pleasure response that the dog attached to each odor. The team believes the results are groundbreaking, as the scent that created the greatest reward response was the familiar human odor. Thus, the dogs appeared to gain more pleasure from inhaling the scent of a human pack member than of inhaling the scent of familial or extrafamilial conspecifics. Therefore, there is evidence that either due to selective breeding or to conditioning or both that the domestic dog prefers the company of familiar humans to the company of members of its own species, regardless of familiarity. The study was published in the highly respected journal Behavioural Processes. Behavioural Processes is dedicated to the publication of high-quality original research on animal behavior from any theoretical perspective (analytic, cognitive, ethological, and evolutionary). According to Behavioural Processes, “the quality of research and the focus on behavioural processes are the sole criteria for acceptance.” The journal’s Chief Editor is Clive Wynne from Arizona State University, who is esteemed worldwide for his research on wolf behavior. The average location of the ROIs (regions of interest) closely overlaid the ventral caudate but was split between the left and right, with peak overlap of approximately 40% on each side. In May 2011, Emory and CPT began collaborating on a humane approach to use functional magnetic resonance imaging (fMRI) to better acquire knowledge related to the human-animal bond, canine cognition, canine emotions, canine sensory perception, and canine receptive communication. Mark co-designed the initial research study, designed the selection criteria for the subject animals, and designed the training protocols, whereby he identified the key variables, then used the processes of systematic desensitization, habituation, behavior shaping, behavior chaining, and positive reinforcement to direct the training of two subject dogs to cooperatively enter the fMRI tube and coil and remain motionless for the required time period. On May 11, 2012, the group published their first paper, Functional MRI in Awake Unrestrained Dogs that documented the process and the cognitive findings for two dogs. The group’s second paper, Replicability and Heterogeneity of Awake Unrestrained Canine fMRI Responses, published on December 4, 2013, documents the process and relevant research findings for a total of 13 dogs. The most recent paper in Behavioural Processes has set the bar even higher by achieving the potentially groundbreaking findings described above. Understanding dogs’ perceptual experience of both conspecifics and humans is important to understand how dogs evolved and the nature of their relationships with humans and other dogs. Olfaction is believed to be dogs’ most powerful and perhaps important sense and an obvious place to begin for the study of social cognition of conspecifics and humans. 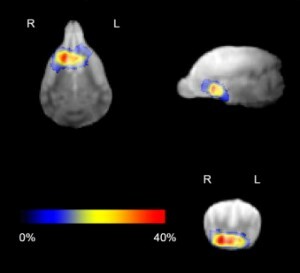 We used fMRI in a cohort of dogs (N = 12) that had been trained to remain motionless while unsedated and unrestrained in the MRI. By presenting scents from humans and conspecifics, we aimed to identify the dimensions of dogs’ responses to salient biological odors – whether they are based on species (dog or human), familiarity, or a specific combination of factors. We focused our analysis on the dog’s caudate nucleus because of its well-known association with positive expectations and because of its clearly defined anatomical location. We hypothesized that if dogs’ primary association to reward, whether it is based on food or social bonds, is to humans, then the human scents would activate the caudate more than the conspecific scents. Conversely, if the smell of conspecifics activated the caudate more than the smell of humans, dogs’ association to reward would be stronger to their fellow canines. Five scents were presented (self, familiar human, strange human, familiar dog, strange dog). While the olfactory bulb/peduncle was activated to a similar degree by all the scents, the caudate was activated maximally to the familiar human. Importantly, the scent of the familiar human was not the handler, meaning that the caudate response differentiated the scent in the absence of the person being present. The caudate activation suggested that not only did the dogs discriminate that scent from the others, they had a positive association with it. This speaks to the power of the dog’s sense of smell, and it provides important clues about the importance of humans in dogs’ lives. For those wishing to read the entire paper, please click the link in the first paragraph. Whole-brain group analysis of differential response to dog and human scents. A transverse slice (left) and two sagittal slices are shown: midline (upper) and right (lower). Color indicates t-statistic at each voxel against the null hypothesis of equal activity to both dog and human scents. Planned future research will study canine social olfaction, vision, learning, inhibitory control, and emotions for applications that the group hopes will ultimately improve the productivity of selection and training for service dogs and military working dogs. In addition the group hopes their findings will empirically improve the industry accepted training protocols used in pet dog programs. In anticipation of continued funding, the Emory/CPT research team plans to expand in 2014 to a team of 30 trained dogs. For more information, please contact Mark Spivak by email (MarkCPT@aol.com) or by phone (404-236-2150).